What leads webmasters to demote their hard build sites into a status of irrelevancy? This is why I *hate* sites that run adsense. Don't people buy listings for the link equity only? 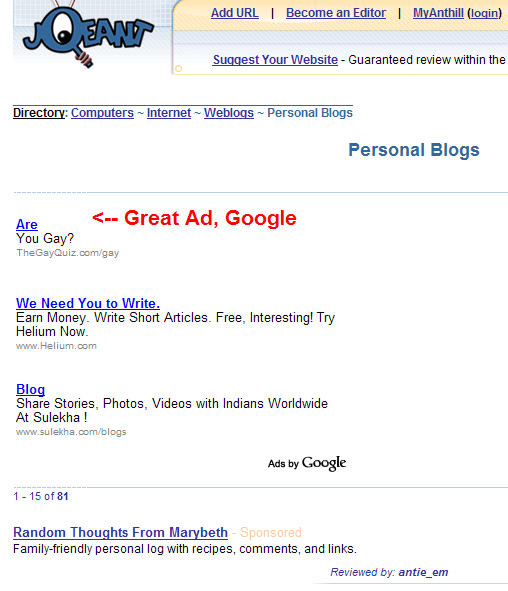 What difference does it make in that case if the directory makes a pathetic attempt at monetization with adsense? As for the thin affiliate sites, is it not just that there are lots more of them now rather than the fact they are no longer edited out? Google says, don't offer paid text links ! But they place "Are You Gay ? " ads on your site. As much as I've grown to loathe Google of late, its the webmaster who chooses to do this to their site. Money is the reason I suppose, but even more than that, the reason is laziness. It's way easier to outsource monetization to Google and hope they do a good enough job. I do that, though I use text link ads and boy is it easy. I think lazy webmasters ought to at least restrict junky advertisers like that on a case by case basis if they must use adsense. I do the same with tla. It hurts to pass up money but it's not worth associating yourself with an irrelevant or spammy site. It looks like they need to improve the words on the page before the ads, and right after the ads. I rarely have the problem of irrelevant ads until I get seriously off topic, and that goes for any site I work on. I'd think JoeAnt would do better on that. But if a site looks poorly done then quality sites are less likely to link to them, their pages are less likely to be indexed, and each link from their site will carry less weight. As much as I've grown to loathe Google of late, its the webmaster who chooses to do this to their site. But those webmasters are not telling the world to stay away from link buying while plastering are you gay ads across the web. Completely agree - what a poor decision by JoeAnt. They've achieved a nice bit of cred and this just ruins it for them. Either they're not getting enough submissions from good sites or they're scaled beyond their means .... either way they look desperate for cash. If this continues we can say goodbye to another directory. You're not looking at desperation, but determination. JA has been stagnant when it came to design for several years. The new topic pages have changed on an hourly basis since I launched them on Tuesday. The section with the Google ads has been specifically designed for future JA advertisers that we'll be accepting once our new merchant account is activated. The above screen shot (which has been changed back to the way I intended to display adsense) is how I imagine the section looking once we have our own advertisers. Great response Joeant. I guess the lesson here is to test w/a sandbox or password protected section, not a live site. People can get the wrong idea with no way to differentiate your ideas / tests from your "real" site. Along with the design came a new topic structure. Once that structure was complete and I knew the design was sufficient enough to display (better than the old one), I really wanted to get it out there for spidering purposes. The cached topic URL's haven't changed, but the navigation has. It's something that has plagued our deeper subtopics for years. The newer browsers also had several issues with the old design.